One of the reasons I think income investors should love stocks like Procter & Gamble (NYSE: PG) is that they can afford a relatively high margin of safety in terms of long-term returns. By that I mean that if you invest when the stock is relatively overvalued things will still end up working better you might otherwise imagine given a long enough time frame. Coca-Cola stock is another good example. As far as blue chip investing goes one of the single worst investing decisions you could have made over the past couple of decades was to buy Coke stock in the summer of 1998. Had you done so at the absolute peak you would have found the shares trading at 50x prior year earnings. Let’s say you ignore the extreme overvaluation and decided to invest $100,000. Assuming you reinvested dividends along the way then your current holding would be worth around $150,000 – equivalent to annual returns of 2.3%. In other words you pretty much matched inflation for the period. Okay, so you’re probably thinking that’s pretty poor – I mean just trudging along with inflation over a near twenty year spell isn’t particularly inspiring. However if the absolute worst mistake you ever make is that you don’t actually destroy any real wealth then you’re doing good. Not only that but this approach ignores the income side of things. In year one you see dividends of $1,400 get reinvested into your pot of Coca-Cola shares. By the time next year’s dividends are distributed you’d probably be looking at around $6,213. Again, that may not be particularly great consolation, but if it’s the worst thing that ever happens to your portfolio then you’ve done a good job. Another stock worth taking a look at over this period is Procter & Gamble, which serves as another great example of what “poor” returns look like with high quality blue chip stocks. Over the whole of fiscal year 1999 the average price-to-earnings ratio for Procter & Gamble stock was about 30x earnings. Let that sink in for a bit. Investors were happy to accept an earnings yield of around 3.3% for P&G stock compared to getting 4.7% in virtually risk-free ten-year US Treasuries. It’s not quite on the mind-blowing level of accepting a 2.5% earnings yield for Coke stock versus 5.5% for Treasuries but it’s still massive overvaluation. Let’s say you ignore the valuation and buy a chunk of Procter & Gamble stock back at the start of 1999. In split-adjusted terms you would be paying around $45.50 per-share in the expectation that full-year earnings would come in at approximately $1.45 per-share. Over the following seventeen years you see the underlying level of corporate profits rise to $3.70 per-share in fiscal year 2016. In terms of the earnings growth rate that comes out to around 5.70% a year on average. The kicker is this: unless you thought back in 1999 that Procter & Gamble stock was going to retain its 30x earnings valuation then you have to be prepared to see that translate into lower actual returns for you as a shareholder. That’s why the stock trades at the $87 mark and not nearer to the $120 price it would be if it were trading at 30x earnings. In other words the ‘cost’, if you like, of investing in Procter & Gamble stock during the dot-com era of overvaluation ended up at about minus 1.85% per-year in terms of capital appreciation. Okay then, so why do I say these stocks end up working out better than you might imagine? Well, check out what happens when you reinvest the dividends. 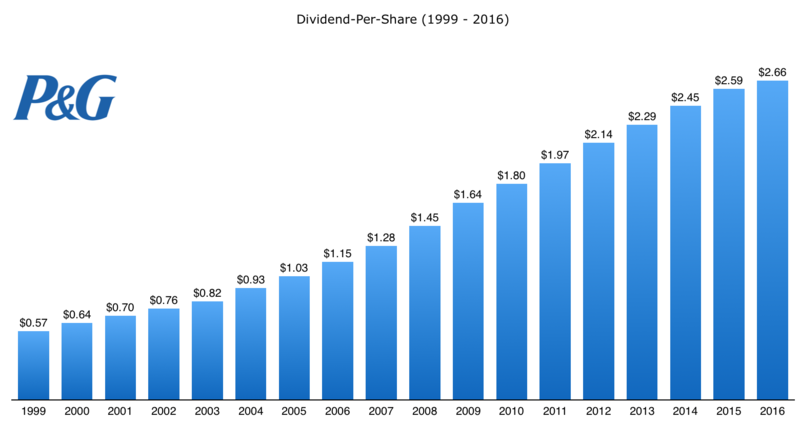 Over the seventeen year period the stock has churned out a total of $28.87 in cumulative dividend income per-share. Over the same period, and assuming the dividends were automatically reinvested, your annual returns from Procter & Gamble stock would have been 6.5% per year. To put that into context an investment in the S&P 500 over the same period would have delivered about 4.9% annual compounded returns. Not only that, but your average yield on cost would be somewhere in the region of 10% for next year if we assume that P&G pays out a dividend of $2.70 per share. If I were to set out that case in short – i.e. that paying 30x earnings for a low-growth blue chip would result in wealth creation at an average rate of 3% above inflation each year – then you probably wouldn’t grumble too much. All of this if from what I would call a pretty extreme scenario too. There’s not all that many occasions when 30-50x earnings pops up for companies with the size and growth profiles of Coca-Cola and Procter & Gamble. Yet in the dot-com bubble that is pretty much exactly what happened. Indeed one of things that separates today’s post-financial crisis bull market from the dot-com era is that the ‘overvaluation’ is spread more evenly rather than mainly being concentrated in the technology sector and high quality blue chips, as was the case back in the late-Nineties. Now a response to that would be something of the lines of “okay the returns were good, but they are overwhelmingly enhanced by the fact that Procter & Gamble trades at 23x earnings which is still historically overvalued”. This is true, but imagine that Procter & Gamble stock trades at 15x earnings instead. At a stock price of $55.95 per-share you’d then have a current dividend yield edging up toward 5%. At that point it would be almost like locking in great forward returns given the nature of compounding and even very low growth assumptions. I mean do the math of throwing in inflation and some stock buybacks and you’ll see how easy it would be to envisage scenarios where you easily make average compounded returns of 10% per-year from that price. So in other words there is some kind of yield protection effect for want of a better phrase. That’s why these kinds of blue chip stocks – the Coca-Colas, Procter & Gambles, Johnson & Johnsons and Hershey Companies of this world – trade at almost perpetual premiums to the wider market, and why exposing yourself to them when they are slightly overvalued isn’t necessarily all that detrimental to your wealth in the long-run. Should You Buy Nike Stock?